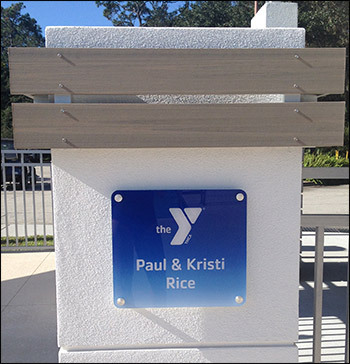 Paul and Kristi Rice recently made a pledge to the Volusia Flagler Family YMCA Capital Campaign and were recognized with a column in their name at the Ormond Beach YMCA pool. The Ormond Y is an aging facility which is long overdue for some major upgrades. The goal of the current campaign is to raise a total of five million dollars. Phase one, which was completed at a cost of $1.5 M, expanded and refinished the pool and deck. The campaign received grants from Volusia County ECHO and Daytona Racing and Rec as well as contributions from individual donors, including a $500,000.00 gift from Chris and Charlie Lydecker. Phase Two will include a dog and people park and additional parking. Phase Three will include a complete refurbishing and re-purposing of the Y building itself plus the addition of a new community center. This year the Volusia Flagler Family YMCA provided 1,634 children with a safe place after school and at summer camp at its Y locations. In addition to numerous programs for seniors and people of all ages, the VFYMCA taught 2297 people how to swim or be safe around water. 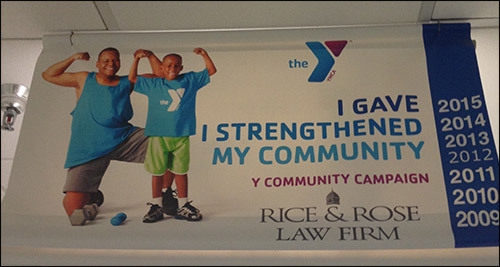 In this season of giving, don't forget your local YMCA.